A group of 41 students from KIS international school in Bangkok made there way down South to learn about the environment and participate in service projects in the local communities. Their journey began with a beautiful and picturesque long-tail boat ride on Chieow Laan Lake in Khao Sok to reach their destination for a day of excursions. The students took an interpretive walk through the forest that led to long bamboo rafts. They took a short ride to coral cave where they learned about the formation of stalagmites and stalactites. The rest of the day they were able to kayak on the pristine lake. 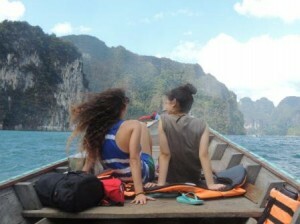 Their next activity was in Khao Sok National Park. 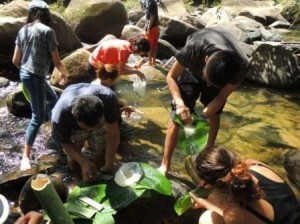 It started with an hour hike through the jungle to reach their camp that was located next to a flowing stream. They learned how to build a fire and prepare rice and curry out of freshly cut bamboo. At the end of the day they were able to cool off in the stream before hiking back. The next day they headed to a local school, originally set up after the tsunami, which cares for over 100 students. Here the KIS students split into three different groups to volunteer. One group helped teach English and led fun activities and games for the children, another group painted tiles with the kids to help nurture creativity and the third group laid cement paths and made lemon grass water. 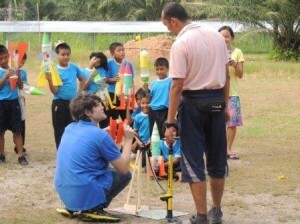 Then everybody watched the kids shoot off rockets they had made earlier in the day. In the evening they had a party where the KIS students performed dance and music along with the school kids. The day was full of laughter and joy, and friendships were made that will last a lifetime! 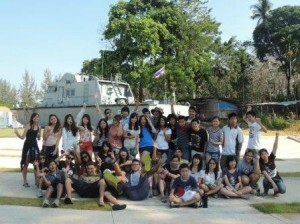 The fourth day was set aside for service activities in Khao Lak. KIS was split into three different groups. One group set up an English camp at a local Burmese learning center. They taught English and played activities through music, sports, environment and art. Another group went to a local Moken community center and museum where they learned about the local traditions and culture of the Moken. They also repaired and painted a wall in the museum. The third group went to a local school and dug a drainage ditch to prevent flooding of the nursery room. The day ended with dinner on the beach and a beautiful sunset sinking into the sparkling ocean water! The students learned, explored and experienced things that allowed them to look at and appreciate the beauty the world has to offer.